Magnetic Resonance Imaging (MRI) creates detailed images of the organs and tissues using magnets and radio waves rather than radiation. An MRI can be used to detect cancer, nerve injuries, brain bleeding, abdominal issues, arthritis, torn ligaments, infections, spinal disc problems, and more. It has long been trusted as an effective, noninvasive imaging technique. 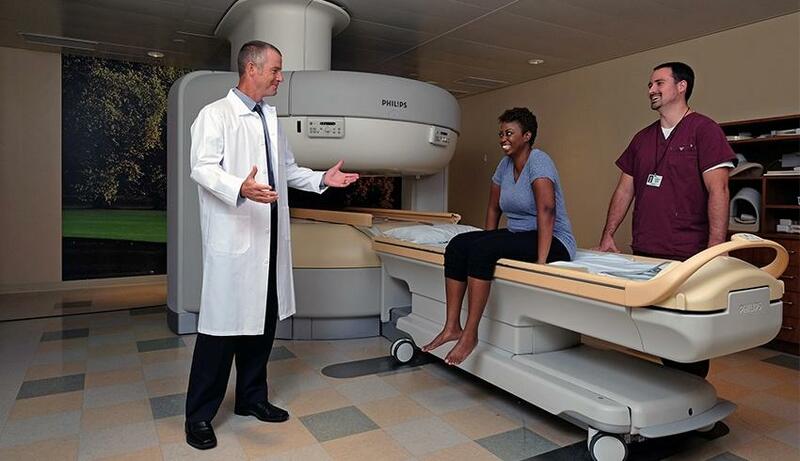 And, the innovation of an open MRI machine further improves the patient experience. The open MRI machine has helped ease the nerves of patients, and provides a more comfortable experience. Those who have difficulty being confined in small spaces will appreciate the additional breathing room offered by the open MRI machine. Claustrophobia is one of the major causes of anxiety during a traditional MRI, and sometimes people don’t realize they are claustrophobic until they’re in the middle of the scan. A true open MRI machine will be open on all four sides. This is especially important for children who are receiving an MRI, but anyone who is nervous in medical settings will appreciate having a loved one in the room while he or she receives the scan. The limited space in a traditional MRI machine isn’t always enough room for someone who is overweight or especially tall. With open MRI machines, tall or overweight patients are still able to take advantage of an MRI for their imaging needs. That extra space also means that pillows or other props can be used to make it more comfortable to lie still for an extended period of time. Because of the increased air circulation around the patient, it’s easier to keep the temperature at a comfortable level during the scan. As technology has evolved to allow for the open MRI design, it has also created a quieter experience. Open MRI machines are often quieter than traditional machines, making for a more comfortable environment. When scans and tests cause anxiety, patients are less motivated to get them done, which delays detection and diagnosis. The comfort of the open MRI machine gives patients even more control over their health and experience. Learn more about about the state-of-the-art services available at Medical Imaging of Fredericksburg.